Order: Most recent items first. Gathered by Bob Gallie for the Labor Beat site. The AFL-CIO: The Workers Must Fix It! provided by the Committee for Labor Access. readings chronicling the lives of steelworkers. struggle to organize fire fighters in Illinois. not all of organized labor supports the Bush Administration's war frenzy. web page links now to: www.laborbeat.org. announcements are posted to Chicago's Independent Media Center site. video. There are two different shows every month. Beat" articles, use the link below. Labor Studies workshops, and unions' "Labor's struggles today" presentations. creating repositories of the Labor Beat documentaries. For complete information and a brochure, CLICK HERE. television resources, which affects some important labor shows. obligations. The amounts are huge to CAC, but tiny to the cable giant. ...) is always at www.cantv.org". CATALOGS on our web site. libraries!) For full information, CLICK HERE. - "Our World Through Jenkins' Eyes." Americans to the Screen Actors Guild. footage. This is that video, "Our World Through Jenkins' Eyes." of airline industry cutbacks since 9/11 on airline employees. 2) "Trade Unions For A Better Tomorrow" 1996  20 minutes. Pakistan and also the fight against the IMF policies. for benefits, pay and working conditions, despite the threats by Gov. media that this was somehow 'unpatriotic' following the WTC attack. "Minnesota State Workers on Strike" is not sold by Labor Beat. information on getting a copy. supporters took to the floor mikes to get the rank-and-file message out. Includes Leedham interview. Video is 13 minutes. - INVISIBLE HAND: THE DEINDUSTRIALIZATION OF SOUTHERN ILLINOIS. coal towns have been affected by mine owners' business decisions. - REPRESSION OF LABOR IN COLOMBIA. Two parts, produced March 2001, cable channel CAN TV19, Chicago. - ANGELA DAVIS SPEAKS ON THE "PRISON/INDUSTRIAL COMPLEX"
and how private corporations are deeply involved. First broadcast Jan. 25, cable channel CAN TV19, Chicago. Fr. Roy Bougerois, has enacted a solemn vigil protest at Ft.
rain filled days of November 18-19, 2000.
was small; but, as in all human rights struggles, present. First broadcast Dec. 28, cable channel CAN TV19, Chicago. Labor Beat is a non-profit and is affiliated with IBEW 1220. The views we express are not necessarily those of IBEW 1220.
are posted on the Chicago Independent Media Center site. "Our World Through Jenkins Eyes" is an overview of his video and audio work. Click here for one of the newspaper articles about him. LABOR BEAT DEMONSTRATES SAME-DAY WORLDWIDE NEWS VIDEO CAPABILITY! through the Internet facilities of the Independent Media Centers. in a January 2001 issue. it to attend a forum on "The NAB, Union Busting, Censorship, & Labor"
23, and ending at Union Square. 'Chicago Protests the WTO' aired this evening without a hitch. We are back on the air, finally! excellent documentary on the WTO protest last December. employee Barb Viola's words, our show contained, "swearing." to any negative or obscene content. for, then has boxes to check labeled in order, "Public,"
have a PEG program in place in our community. been challenged and upheld in court many times. the show that was denied airing, is far from indecent or obscene. considered legally as obscenity in our society. both illegal and a constitutional violation of our rights. again our legal rights continue to be violated. us reasonable time to replace any tapes you deem defective. about news organizations' deliberate ignorance. 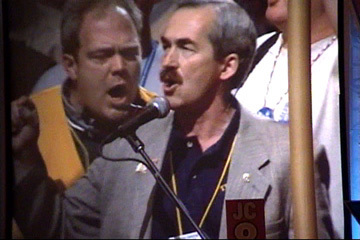 United Brotherhood of Carpenters in Chicago in August, 2000. Labor Beat / Labor Express shows are being edited. Resources for the Labor topic, your page ranked 7th. at tens or hundreds of thousands of pages in bestowing their awards. somewhere, noticed your page and liked it enough to select it. popularity for our analysis to select your pages automatically. or bartered livestock as inducements to add new sites to our lists. Once again, congratulations on your award! Links2Go Awards.